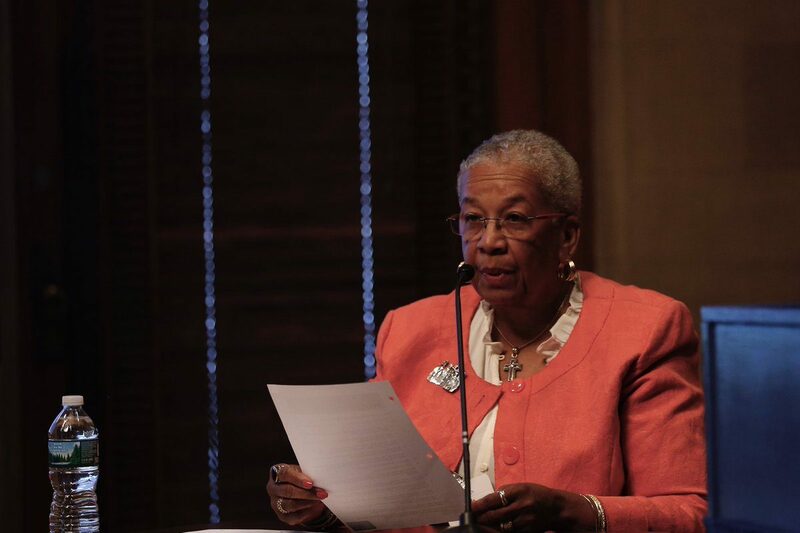 The hearing before State Education Commissioner MaryEllen Elia regarding the removal of Carl P. Paladino from the Buffalo School Board was supposed to be about Paladino, but for most of Thursday, it was the school board president, Barbara Seals Nevergold, who was in the hot seat. Throughout five hours of testimony, Nevergold was grilled about whether she convened improper, and possibly illegal, closed door meetings of the board. During a particularly intense period of cross examination, Nevergold was unable to convincingly explain how an unofficial meeting she called on Jan. 17 to obtain "legal advice" resulted in members of the board agreeing to affidavits to petition seeking Paladino's removal. Only seven of the nine members met. Neither Paladino, nor ally Larry Quinn, were told of the meeting. The petition seeking Paladino's removal was not formally discussed and voted on by the full School Board until the next day. But Paladino's lawyers said six of nine board members agreed on a course of legal action the day before, without any public notice of a meeting, violating of the Open Meetings Law. "What I'm wondering is since this was a board action, when did the board come together to vote on this issue?" asked Jennifer Persico, one of Paladino's lawyers. Persico reinforcing petition wasn't authorized until the vote on Jan. 18. Yet "strangely" the petition was served on Paladino the same day. And affidavits were already signed. Frank W. Miller, the lawyer for the board majority, said he was surprised at the number of questions thrown at Nevergold on this first day of testimony but was prepared to adjust. He also defended the actions taken by the majority on Jan. 17. "The law is, if you are meeting privately with your attorneys you are entitled to do so," he said. "And that constitutes an exemption to the Open Meetings Law." He did not agree that the board took action as a group during the session, which would constitute a violation of the law. Nevergold was the one and only witness questioned Thursday. A total of 14 witnesses are scheduled for the hearing, making it likely that the hearing will extend will into next week. Dennis Vacco, the former state attorney general, who is leading Paladino's legal team, described Nevergold's answers as "evasive" and described his team's intention to repeatedly show how Nevergold and the rest of the board majority broke sunshine laws left and right, and yet are now accusing Paladino of sharing information that should have been kept secret. "There's a concept in the law of unclean hands," Vacco said, with a grinning Paladino beside him. "I mean, How do they violate every rule in the book? How do they violate their own code of Conduct, the Open Meetings Law, then all of a sudden show up here come here sanctimoniously claiming Carl is the bad guy?" Clearly, he said, the board wanted to get rid of Paladino because of his comments in December to Artvoice that have been condemned as racist. But in light of the board's inability to remove Paladino for exercising his First Amendment rights, the board majority members eventually changed their legal strategy to try to remove Paladino for violating the board's Code of Conduct. Paladino's lawyers repeatedly presented information at the last minute over repeated objections by the lawyer representing the board. But Commissioner Elia gave Paladino's defense team latitude to present their documentation, almost all of which portrayed the board as regular violators of the Open Meetings Law, improperly discussing matters in private that should have been discussed in public. Miller helped Nevergold highlight the board's Code of Conduct, which does not allow board members to share information discussed in private sessions with the public. The board has attempted to show that Paladino has willfully and repeatedly ignored board rules. Upon cross examination, Paladino's lawyers played video after video showing that Nevergold repeatedly convened closed-door executive sessions by citing broad language like personnel or legal matters instead of being specific, such as when the board spoke about negotiations regarding the long-expired teachers contract. Paladino's lawyers also pointed out that the board issued press releases regarding the status of contract negotiations with the Buffalo Teachers Federation, which remain on the board's website, in an attempt to contradict the assertion by Nevergold that all closed-door discussions regarding the teachers contract were barred from disclosure.